There are many reasons people vote Republican besides stupidity and racism. 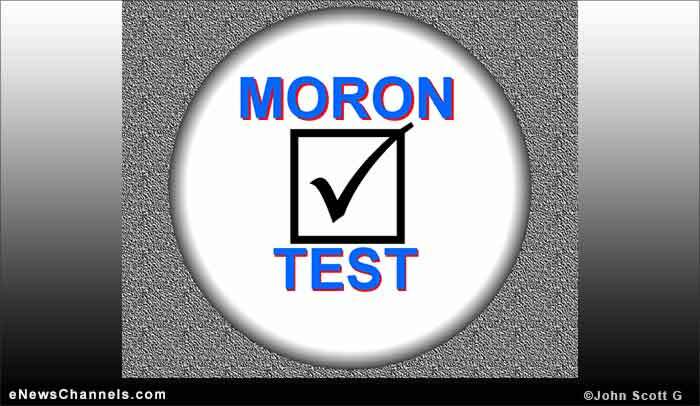 With so much doubt and confusion swirling around “the moron party,” we thought it was a good time to provide this little test. You can try this quick and easy examination for yourself as well as give a copy to close family members, friends, coworkers, neighbors, and that weird uncle who always ruins your family gatherings by spouting rightwing nutjob nonsense he heard on “the Fox News.” Most importantly, this experiment will help you find out if you, too, are ready to get in touch with your inner douchebag. a) Try to learn from it. b) Apply it to what you already know. c) Scream “la-la-la-la-la-I-can’t-hear-you” as long and as loud as you can. a) Newspapers not published by Rupert Murdoch. b) Magazines like Mother Jones, In These Times, and The Nation. c) Fictional sources such as Faux News and the Sludge Report as well as phony think tanks such as Heretic Foundation and The Kay-Toe Institute. a) Put strong safeguards in place immediately. b) File criminal charges against the corporation, its officers, and the colluding governor who has financial ties to the offending company. Oh, and put strong safeguards in place immediately. c) Yammer about how corporations are being shackled, free enterprise is under threat, and trees cause pollution (even if they are the right height). a) Live and let live. b) Tolerant is as tolerant does. c) OMG OMG OMG two mommies or two daddies??? Won’t someone pull-ease think of the children?!?! a) The female gender of humankind. b) Fifty-one percent of the population in America. c) Poor little lost souls who cannot control their libido, their opinions, their bodies, their mouths, their lady parts, their … (insert RWNJ anti-women “ideas” here). a) There’s a fellow human being. b) There’s a person whose culture may have something to offer us. a) Wealth inequality is harmful to democracy. b) The concentration of wealth poses a threat to society. c) If some guy is rich we should listen to him and maybe even give him a TV show. a) Faith is a personal choice; leave the government out of it. b) Religious freedom is a cornerstone of America. c) I love Jebus and people who don’t will go to hell! a) It will be great when we can advance to a post-racial society. c) It’s a terrible infringement on us poor downtrodden white people to say we can no longer publically call a spade a spade, if you get my drift. a) You are alarmed at the parallels between the mind-set of people in the Third Reich and those in the GOP. b) You want to fight against it in the world and hope to eradicate it in the US. c) You say you absolutely deplore Fascism but you worship authority, conformity, directives, racial purity, closed borders, war, government subordinate to industry, and the freedom to practice any religion as long as it’s Christianity. a) The Bill of Rights. c) Naming a lot of high schools after Ronald Reagan. a) Clean air and water. c) Stock options in large unregulated corporations. a) You like roads, schools, libraries, and the electrical grid. b) You like sanitation, food inspections, and safe medication. c) You like giving tax breaks to corporations and to individuals making more than a quarter-million dollars a year. 14. Since the GOP is so detrimental to the progress of the USA, what is holding up the elimination of that horrible organization? a) The GOP moron base. b) The RWNJ billionaires funding the GOP. c) Benghazi! IRS! Socialized medicine! They’re coming to take our guns! We must starve the children of the poor! Only moochers want affordable health care! a) Independent journalism like the Hightower Lowdown. b) Updates from organizations like Media Matters. c) Reed? Whataya mean by that, ‘xactly?